Let's face it, some beetles have more flair than others. 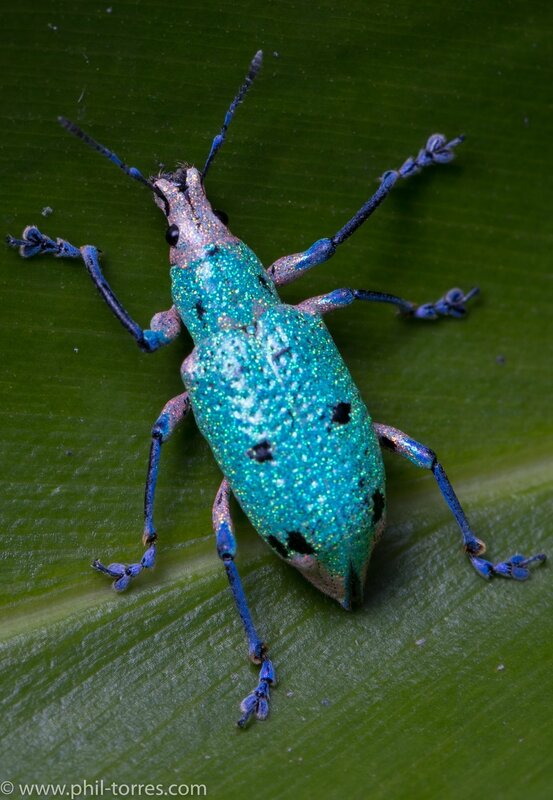 In Ecuador, I found this Compsus benoisti weevil which has to be the sparkly champion of them all. While out walking at the Septimo Paraiso Lodge in the cloudforests of Mindo, Ecuador, something shiny flew past me, and landed on a leaf. To my surprise, this weevil wasn't just shiny- it was glittery, sparkly, and let's be honest, all around fabulous. Weevils evolved about 220 million years ago, so it's no surprise evolution has had some fun along the way. Here's a collection of the images I shot of it while out there. So, why did these beetle evolve to be so darn glittery? According to Dr. Ainsley Seago, it likely has to do with crypsis, or blending in. Weevils in this subfamily of Entiminae are often found around and feeding on leaves, so the colors may help them blend in the eyes of a predator.